You've heard of Lake Tahoe as a premier ski destination, but what you may not know is that Tahoe actually has more visitors in the summer. That's because there is so much to do, especially for families on the go. Here's but a preview of what you may find next to the emerald shores of the lake (or in the Tahoe Basin). Families flock to the Truckee River for a day of mild river rafting. We hit the river for a bit of mild adventure and what we found was a relaxing day of floating and swimming. We highly recommend this for a great family activity. 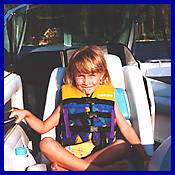 Another water activity that is great for families is kayaking. The water of Lake Tahoe is usually quiet and still in the morning and this makes for some great kayaking. There are several places to rent kayaks around the lake. Go double kayak for you and a little one or turn your older kids loose on their own. More here. Pick your pleasure of other water activities. 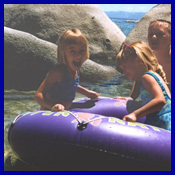 Lake Tahoe has got great sand beaches (they happen to be bigger this year due to low snow last season), parasailing, wakeboarding, sailboarding, waterskiing, tubing, jet skiing, and even snorkeling, will keep your clan busy. The small lakes and reservoirs around the area are also great spots to take a swim. Exploration is the word - pick a different spot each day. And that's just the water. There are so many hiking and biking trails: the Emigrant Trail and the Pacific Crest Trail to name just a few. Add roller blading, horseback riding, golf, tennis, hot air ballooning, and more to the list and you'll just have to spend the summer. Check back for more details on all of the things to do in the Tahoe area.